I had to pick up a banner that I had made for the pastors conference starting Monday. I gave them a computer printed copy of what I wanted on it... 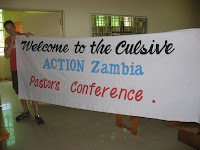 Welcome to the ACTION Zambia Pastors Conference. I told them I wanted the "Welcome to the" in cursive. They didn't seem to understand cursive. So, Pete said script and they got script. So we agreed, it would be in script. I explained the rest and boom, we are good to go. So, I don't know why I was a bit nervous to pick it up. TIA. This is Africa. I mean, misspelled word, something, I had low expectations. So, I picked it up and this is the banner. I am still laughing about it. Then, I went to pick up a refund check for our director for his car, to find out that the machine that does this is broken and they are doing it by hand, so it will be awhile. And then I went to get some money out and the machine ate my card. And then I had to go the other bank (which I didn't want to go in the first place because the traffic is always awful) and wait in line because my card was eaten by the machine at the other place. And then on the way home, I got pulled over for going 15 under the speed limit. Seriously. I mean, they said I was over the speed limit, but I was under by 15. I always drive slow because the speed trap machine thing doesn't work and they like to pull over Mzungus. And after a bit of arguing, (they didn't so confident in their machine) they let me go. But, you know, APT - Africa Produces Thankfulness. It is hard to complain here. I had a car to drive back and forth. I have money in the bank. I am healthy. I have a healthy family. I have a home to go home to. I know Jesus. I love Jesus. I mean, how can I begin to complain, especially when complaining is a sin. I think I was actually thankful, and was able to redeem the day and laugh about it and be thankful. I think I was. And, you know, I think I saved the best for last. Though it is hard at times, frustrating and vexing, in reality, there are lots of days like today, after a great safari, like this this evening of sitting in the sun holding my baby, a morning which started with a wonderful bible study at my church and some touring later with one of my pastors in poor slum showing us his plot to build a church, there is a welling up of joy and gratitude to God that he has allowed us to be here. 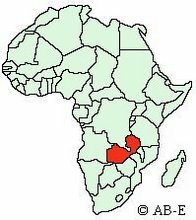 It is these moments and a lot more moments, where this other acronym must be used to desribe my feelings: ILA - I love Africa. TFP - Thanks for praying. That was the funniest post I've ever read. Both Jason and I were laughing out loud when we read your sign!! Love all the abbreviations you've come up with. We'll have to use them too when we're there. As I sit here at my desk at work reading your blog, I had to laugh outloud at the "culsive." That's so funny. We Americans do expect other cultures to be able to read our minds, don't we?